Courageous Dads Need to Pray! 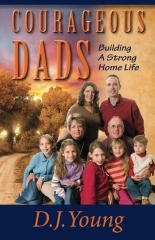 AN EXCERPT FROM COURAGEOUS DADS. Why do we pray? Because God answers prayer. In prayer we open our hearts to God, tell him our needs, and wait for his answer. No one has ever seen God, but the believer who has been given spiritual life and insight knows that God exists, that he is the Creator of heaven and earth, that he sent his son Jesus to earth to die for the sin of the world. Jesus died on the cross to pay the price for sin and to enable those who believe in Him to have eternal life. In gratitude for such a tremendous gift, believers are eager to serve him. The source of eternal life is the Holy Spirit whom God the Father gives us for the asking. The Holy Spirit lives in the believer and continues to instruct, guide, and encourage him until he is forever united with God in heaven. Certainly, heaven is on the side of the believing, praying Dad as he raises his children. There is no limit to what you can ask God to do in your life and in your family. You can have his wisdom, his mercy, his grace and his provision any time. You can keep in touch with God everywhere, at all times day and night, through prayer. How significant is prayer in your family? It is up to you as the family’s spiritual leader to involve everyone in prayer. Teach your children to pray when they are young and make family prayer part of everyone’s collective identity. Maybe start with memorizing the “Our Father” or the “Ten Commandments” with your child. Guard your personal prayer time. Have a plan for reading God’s word and discussing your needs with God every day. Listen for his answers, pay attention to his guidance and creative input. Expect God’s intervention on your behalf. Train yourself to recognize the answers to your prayers. Family prayer can coincide with meal times. Prayer does not need to be formal. You can pray for safety before or while you travel. You can share family and personal needs during family prayer time. What is a family altar? It is a specific time when the family meets to praise God and express needs and desires to him. A family altar is a wonderful way to unite the family and to strengthen everyone’s relationship with God and one another. You experience the power of prayer only when you actually pray. If you pray faithfully, you will discover that the Holy Spirit guides you and provides you with resources for every task. The hallmark of a praying Dad is courage and confidence. Prayer is also part of your testimony, which is your story of how Jesus Christ came into your life and how you continue to do life in accordance with his will. Your faith and the ways he has answered your prayers highlight your personal story. If you are a praying Dad you have experienced how God draws close to you especially during trying, difficult times, when you cling to him in prayer. Problems are designed by the enemy to make you lose faith and quit praying. The tempter has one goal: to make you stumble and fall. If you maintain your daily prayer life you will have victory in both instances. You can put your suffering in perspective so that it cannot rob you of the joy you have in the Lord; and your rejection of temptation strengthens your commitment to God and to your family.